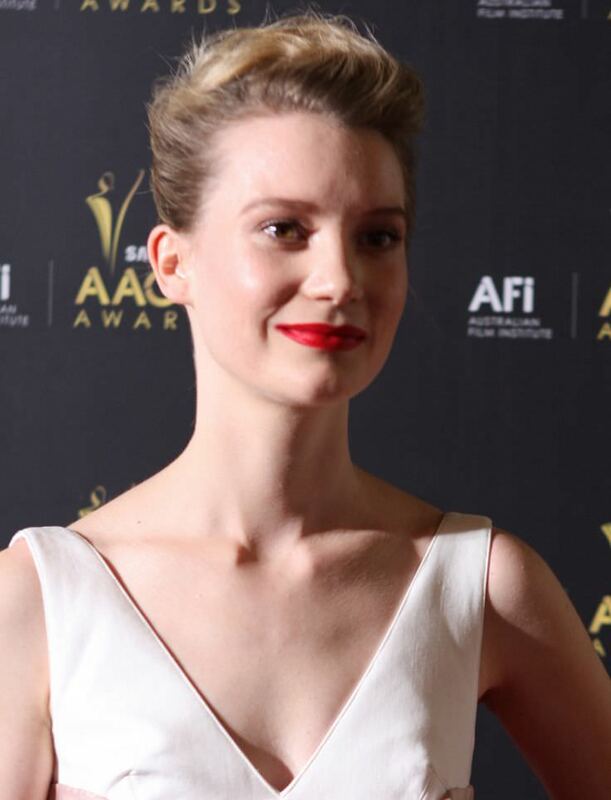 Mia Wasikowska at the Samsung AACTA Awards 2012 in Sydney, Australia. Mia Wasikowska is an Australian actress. Films: "Alice in Wonderland", "The Kids Are All Right", "Jane Eyre", "Albert Nobbs", "Stoker", "Only Lovers Left Alive", "Madame Bovary", "Maps To The Stars". In 2011, she was among the Time magazine's most influential people in the world. She is widely regarded as one of the finest actresses of her generation. She has been nominated for 2 Australian Film Critics Association Awards, a Screen Actors Guild Award and 2 British Independent Film Awards. She has won an Australian Film Institute Award and a Hollywood Film Award. She is of Polish descent. She lives in Bronte, Wales, and she is currently dating actor Jesse Eisenberg. Mia Wasikowska is a famous Australian actress, who was born on October 14, 1989. As a person born on this date, Mia Wasikowska is listed in our database as the 5th most popular celebrity for the day (October 14) and the 25th most popular for the year (1989). People born on October 14 fall under the Zodiac sign of Libra, the Scales. Mia Wasikowska is the 148th most popular Libra. Aside from information specific to Mia Wasikowska's birthday, Mia Wasikowska is the 24th most famous Australian. In general, Mia Wasikowska ranks as the 1846th most popular famous person, and the 361st most popular actress of all time. “The Famous Birthdays” catalogs over 25,000 famous people, everyone from actors to singers to scientists to serial killers and more. If you're curious to see who was born on your birthday, you can use our database to find out who, what, where, when and why. You can search by birthday, birthplace, claim to fame or any other information by typing in the search box, or simply browse our site by selecting the month, the day, the horoscope, or any other clickable option.